The festive party season is just around the corner and we’re sure you’ll want to impress clients, colleagues, and even your wife, at the exclusive events you’re attending. Well, at HKT, we believe nothing exudes sophistication and looks better at a glitzy Christmas event than a custom made tuxedo. But before you call us to have the perfect party suit made for you, we thought you’d appreciate a comprehensive lowdown on the tuxedo and all the options you might want to consider. Why should I buy a bespoke tuxedo instead of something off the peg or a rental suit? Maybe more than any other suit a tuxedo is an investment. That’s because you won’t necessarily wear it that often, but when you do wear it you’ll want to look a million dollars. Buy something off the peg or hire from a rental store and that simply will not happen. What a made to order tuxedo from HKT delivers is a perfect fit with absolutely no pinching which may hinder your movement or wrinkle the fabric. The pads in the shoulders won’t jut out like they so often do with off the peg and rental tuxes. The back of your suit jacket will fall neatly and in a straight line when fastened. And the fabric around your stomach will be close to your body, but not tight, and certainly never strained. Everything we create will align with your physique flawlessly, making you feel like you really do have a chance of becoming the next James Bond. What color should I choose for my tuxedo? For purists, the only option is black. And to be honest, black does look great on all types of men. But that’s not to say that you shouldn’t think about having a tailored navy tuxedo, burgundy tuxedo or even grey tuxedo made for you, if that suits your personality and the events you’re most likely to attend. Of course, the other color of tuxedo you may have seen a lot of in films, or worn by celebrities, is the white tuxedo. In our opinion, this is a look that’s definitely best kept for a formal themed party or wedding – or if you’re in the habit of picking up an Oscar. That’s because it can look a bit cliché (even tacky) at the wrong event, and it’s a style that even makes some of the best-dressed men in the world look like they should be serving cocktails on a cruise ship. What fabric should my tuxedo be made from? Typically, a tuxedo jacket that is going to be worn at an evening occasion should be made from a wool cloth. This is a safe and stylish option for all men, and we have many samples of these fabrics at our store which you can look at and choose from. An alternative, and more flamboyant, option to wool is velvet. This choice really exudes finesse and elegance, and is definitely a fabric that will help you stand out from the crowd. Velvet looks particularly good in non-traditional colors such as green, red and blue, although a handmade black velvet tuxedo is a personal favorite of ours. 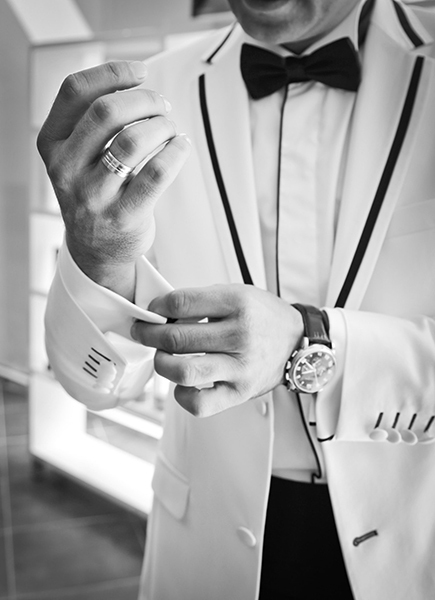 Finally, if you’re having a summer wedding – or maybe attending an evening event somewhere hot – you could think about having a bespoke linen or cotton tuxedo suit made for you. This choice looks refined and will keep you cool under a blazing sun. Should I choose a single or double breasted tuxedo? If you want a traditional tuxedo, then a single-breasted jacket with a single button is definitely the way to go. Also, bear in mind that this button should remain closed at all times when you’re standing, as it will help to show off the cut off your tuxedo. If you fancy something a bit more contemporary, a bespoke double-breasted tuxedo could be exactly the right choice for you, especially as double-breasted suits have had a renaissance of late. What’s particularly important about this style is that the top button of a two-button jacket should always be buttoned up, and the last button of a two or three-buttoned jacket should remain open. This is to prevent the jacket from hanging awkwardly. Should I have vents in the back of my tuxedo? Vents are the slits at the back of a jacket. To achieve the slimmest silhouette, and to adhere to formal tradition, a tuxedo jacket should have no vents. However, double vents (slits at each side of the back of a jacket) are a good option to increase comfort and improve access to pockets. What we always avoid is a single vent in the middle of the back of a jacket, which is something you’ll often find on an off the peg or rental tuxedo. That’s because a single vent jacket is usually cheaper to produce and easier to fit to a certain level than an unvented or double vented jacket. What type of lapel should my tuxedo have? You actually have quite a few options regarding lapels, with each one having their own individual benefits. There are also a couple of attributes that every pair of lapels should have. One is that the left lapel should have a working buttonhole so a boutonnière (floral decoration) can be worn. The second is that the facing of your lapels should have a high-luster appearance, whether that’s through the use of smooth satin silk or grosgrain, which is less reflective due to its ribbed, subtler texture. This style is when the tip of the lapel points upwards, standing proud from the collar. It’s considered the most formal of the lapels described here and is commonly found on dinner and double-breasted jackets. This look is characterized by rounded lapels that are joined to the collar to make an unbroken loop around the shoulders and the back of the neck. It’s a popular style for a tuxedo because it delivers a sleek, debonair look. The notched lapel is when the lapel is sewn onto the collar of a jacket at an angle, creating a triangle between the two. It’s the lapel which features on most everyday suits, which is why it’s popular for a dinner suit, even though it’s not classic tuxedo style. This style is much more contemporary than the three above. It features either a narrow satin trim on the edge of a lapel, or a thick stain trim that leaves just the edge of your suit’s fabric exposed. The color of the satin tends to be the same as the jacket, although your lapel could feature a contrasting color if you want to stand out. What type of buttons and pockets should I have on my tuxedo? The buttons on your made to measure tuxedo should be either plain black or covered in the same facing as your jacket’s lapels. On the sleeve you should have four touching buttons, just like a suit jacket. With regards to pockets, we usually recommend that the lower pockets on your tuxedo are jetted (slits with no flaps), and you have a flat welt pocket on your breast for your pocket square. Should I wear a formal vest or cummerbund with my tuxedo? We definitely recommend that you wear either a formal waistcoat or cummerbund, because it’s an important part of the black tie look to conceal the waistband of your trousers all the way around. If you want to go down the more traditional route, then a formal waistcoat is your best option. It can be double-breasted or single-breasted, and it’s usually cut low and wide to show the front of the dress shirt underneath (a horseshoe front is particularly popular at the moment). A tuxedo vest is typically made from the same fabric as your jacket, and features shawl lapels in the same fabric as your tuxedo’s lapels. However, we’re not opposed to doing things differently if it achieves the right look for you. Just in case you don’t know, a cummerbund is a pleated sash that wraps horizontally around the waist. Traditionally, it is made from the same fabric as your tuxedo lapel facings. If you’re wearing a classic black tuxedo, then your cummerbund is usually black too. However, if you want a less formal look, you could go for another dark color such as burgundy, forest green or indigo. Alternatively, if the color of your tuxedo is not black, we recommend that your cummerbund matches this color. However, if you’re feeling daring, you could go for a different color to create a striking contrast. What type of shirt should I wear with my tuxedo? A great looking tuxedo can easily be let down by a shirt that fits poorly around the chest or neck, or has sleeves that are too short or too long. With this in mind, we recommend that you have a tailored shirt made for you which will complement your bespoke tuxedo to the max. This shirt should ideally be plain white and have a turn down collar or wing collar, with the turn down being the traditional choice for a tuxedo. Your shirt should also have a rectangular panel running up the front of it which features vertical pleats or a dimpled pattern called marcella. On your shirt, think about ditching the buttons and choosing to have buttonholes on both edges of your shirt which are closed with decorative studs. These really do project refinement and will finish off your look perfectly. All good dress shirts should also feature a French cuff which is fastened with cufflinks. These cufflinks should match, or at least complement, the studs that fasten your shirt. What type of trousers should I wear with my tuxedo? As with your shirt, we recommend that you have some custom made trousers created for you to enhance the look of your tuxedo jacket and create the most flattering silhouette. Traditionally, the color and material of your trousers should match those of your tuxedo jacket. However, that’s not to say that you can’t have a burgundy velvet jacket and black wool trousers, or another striking combination that works for you. Mainly, your trousers should be simple, apart from a strip of ribbon made from the same material as your jacket lapel facing (often called the braid) which is used to conceal the outer seams. Your trousers shouldn’t have cuffs, and pockets are normally simple vertical slits situated at the back edge of your braid. The waist of your trousers should be high, so when combined with a waistcoat or cummerbund your waist is covered fully. If you’re going for a classic look, suspenders should be worn and no belt loops added to your waistband. But if you prefer to wear a belt, we can always add loops to your bespoke trousers. With regards to pleated or flat-fronted trousers, we recommend flat-fronted, as this give will you the most stylish look. And finally, think about having two pairs of trousers made when you order your bespoke tuxedo suit. That’s because trousers will typically age quicker than a jacket. What type of tie should I wear with my tuxedo? Well, it has to be a bow tie, of course – and preferably a real one rather than a pre-tied one (check out this YouTube video on how to tie a bow tie). But did you know that there are quite a few different styles of bow tie to choose from? Main shapes include the butterfly, batwing, diamond point and rounded club. Take a look at this guide to view them and see which shape you like. Another option is to wear a long necktie with your custom made tuxedo. For some men, this will look fantastic. But we think it’s a shame not to wear the classic bow tie, given that you probably wear a necktie most days of the week. What other accessories should I wear with my tuxedo? If you’re going for a true classic look, suspenders are a must. Ideally, these should be buttoned to your trouser waist, rather than using clip-on suspenders. However, because suspenders are usually hidden under a jacket and waist covering, we won’t be a stickler for tradition this time. An elegant white silk pocket square is the way to go here. But don’t just stuff it into your top pocket. Take a look at the different pocket square folds you could use and search online to see how you can create them. We particularly like the plateau and fedora shapes, because they offer a nice contrast against the sharp edges of a black tie. Simple black leather shoes are the classic choice. These could be in a matt or patent finish, the latter giving you a more striking, glossy look. Velvet lace-ups and loafers are also an elegant option that can finish the black tie look perfectly. In contrast, don’t go for brogues or anything too elaborate, as they will draw people’s attention to your feet. What tuxedo options are there for women? Tuxedos are definitely not just for men. Women can look absolutely stunning in a made-to-measure tuxedo that’s been paired with some close-fitting trousers. Take a look at Emma Watson, Anne Hathaway and Anna Kendrick for some inspiration. And if this is a style you’re interested in, please get in touch with HKT. Our style consultants have a comprehensive knowledge of tuxedo options for women and can discuss what styles will work best for you. So there you go, our rather exhaustive guide to tuxedos. We hope you’ve found it helpful and have a clearer idea of what you need to consider when getting a custom made tuxedo created for you. Although, of course, our team at HKT will be more than happy to discuss all your options and recommend what will work best for your physique, coloring and character. So please get in touch with us on +1 770-458-8682 or service@hktclothiers.com to book an appointment with one of our style consultants. We’d really love to create a tailored tuxedo for you that will make you feel and look like a million dollars.